Come visit us in the Young Building (Building #3)!! We will have a CMM, video measurement machine, and the new Equator by Renishaw in the booth with all data collected by QC-CALC and reported via the new dashboard technology in the Enterprise Report Scheduler 3.3. Product Spotlight: SPC Office Buddy 3.3 Released!!! Prolink is very excited to announce the release of the SPC Office Buddy v.3.3. Email your finished Excel report to a list of recipients straight from the Excel Job. Combine multiple Excel Jobs into a Batch Job to create more complex reports from multiple QCC files. Run this on a scheduled timer or from a batch file to automate it further. 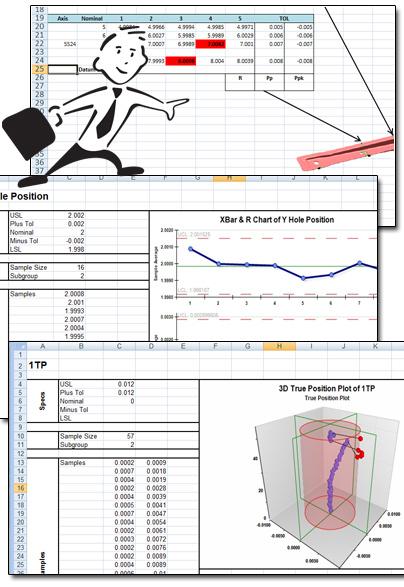 Run True Position charting (including the 3D True Position charts) in the Buddy without the need for SQL Server. Easily share your Excel Jobs with improved exporting/importing of Excel Jobs. The Buddy now bundles up all necessary information into a single zip file that can be emailed and unpacked by the recipient. Optionally stack similar dimensions in both Minitab and Prolink Charts using the new Dimension Stacking feature for increased flexibility. Remove outliers before running charts and statistics using the new Outlier Removal feature. Clean up your unused tags - Create a bunch of extra tags in your Excel spreadsheet and didn't use them all? Tell the Buddy to clean them up for you and your report will always look clean! Re-use your filtering from QC-CALC - The Buddy now understands and can share record and dimension filters with QC-CALC. Set them once. Use them in both products! ...and of course a growing list of new tag types. Download the latest version of the Buddy from our website at http://www.prolinksoftware.com. Tip: Collect data from file-based equipment in QC-Gage! This is something we were really excited to add because we've found that there are a whole spectrum of gages on the market. The smartest ones (CMMs and Video Measurement Systems) output entire parts at a time and go directly into QC-CALC. The simplest gages (micrometers, height gages, etc) output straight RS-232 values and go into QC-Gage. Then there is that gray area that contains lots of small specialized machines used for roundness, hardness, compression, or pull tests. Those machines output a file like CMMs but the files are typically custom and do not contain extra information such as tolerances, nominals, trace fields or even the part name. To deal with these specialized machines, we added the ability to collect measurements from files to QC-Gage. Now you can simply run a spec plan and collect small machine data as if it came from a standard hand gage, but still be able to enter trace field information. The gage scripts work identically to normal RS-232 gages and all the rules are the same. The values just happen to be coming from an output results file from a machine rather than a hand-held gage. In QC-Gage 3.3, set up your gage scripts as you normally would (or have Prolink help you). The Advanced Gage Script screen has been improved to handle file based gage script testing. 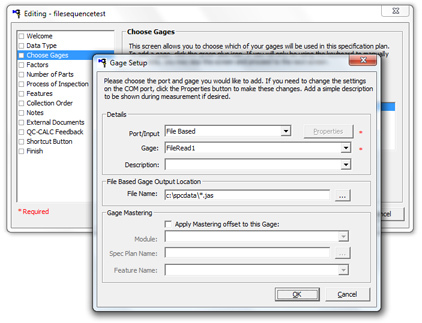 In the Spec Plan wizard, choose your gages the normal way in the third step. However instead of choosing an RS-232 port, scroll to the bottom of the list and choose File Based. Specify the path just below in the File Name box. You can use wildcards in the file name if necessary. Set the dimension source of any dimension to the file based gage the normal way. Finished. When you run the spec plan, QC-Gage will look for the file(s) in your scripts and treat them as normal gage values. Download the latest version of QC-Gage 3.3.